Need a gift for someone special? Look no further – it’s here! The Little Hamper Company have gift hampers galore. With lots to choose from already, there is even more to come! Established in February 2018, The Little Hamper Company was born by two friends, Sophie and Bobbi. Initially, it was their love of board games and prosecco that brought them together in a sleepy village in Lincolnshire. After that, their connection for all things luxury in the gift world was realised and the ideas started to flow. These are no ordinary hampers; Luxury items are placed in white or black ribbon tied boxes to suit your gift receiver. Their range includes Cocktails, Gin and Tonic, Afternoon Tea, Hot Chocolate and Whisky to name just a few. They also offer a ‘Build your own hamper’ service. Do you know someone who loves chocolate, gin, prosecco AND tea? Just choose your hamper, add your items and…voila – a personalised hamper for that ‘hard-to-buy-for’ friend. If you have a particular theme in mind or a product that you wish to include, get in touch with the team, and they will try their best to find it for you. Sophie and Bobbi are continually expanding their range of hampers and as a result of this they now offer a ‘Two Chimps Coffee Hamper’ – THAT’S our kind of gift! 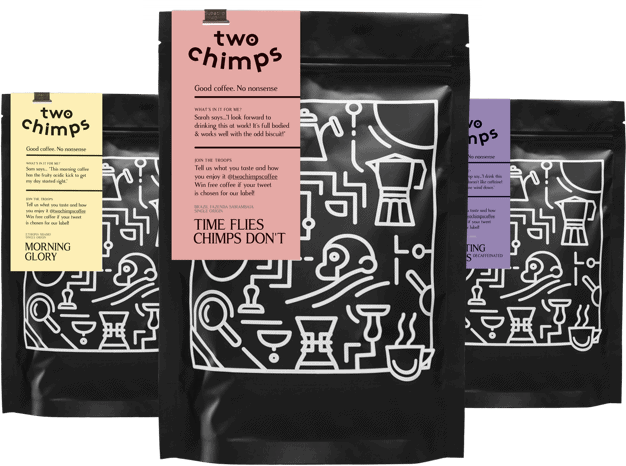 Here at Two Chimps, we freshly roast our coffees by hand and in small batches. We deliver little and often to the little hamper company; ensuring that the coffee is always at its best. Included in the coffee hampers provided by the little hamper company are three 50g tasters of Two Chimps Coffee. These are freshly roasted and ground for you to enjoy in your cafetiere. Eyes Wide Shut from Colombia – A coffee with a great big kick of berry sweetness and a creamy, complex, lasting taste. The Tiny Horse from El Salvador – a smooth, easy drinking coffee with a more-ish biscuit sweetness. The Cat’s Pyjamas from Guatemala – A silky smooth, full-bodied coffee with an apple-like acidity. Strong hints of chocolate subside into hazelnut as it cools. All three have been roasted a little darker than some of our other coffees; this gives the appearance of a slightly stronger taste. Along with the tasty coffee, these hampers include a tin of shortbread biscuits from the ‘Shortbread House of Edinburgh’ and a grey coffee mug. There are also some additional extras that you can add to your coffee hamper such as; a ‘But first coffee’ spoon and/or an individually wrapped fruit cake from the ‘Tipple Tails’ company. Choose your white or black box to finish it off, and you’re done! Your coffee lovers hamper is complete. Already picked a hamper for your coffee lover? Are you now intrigued to taste the coffee? Then order some from our shop today – with Free 1st Class Delivery.